Nobody ever went broke underestimating the average homeowner's desire for easier, faster, and cleaner tile solutions. Thankfully, a few tiling innovations have been introduced in recent years, changing some aspects of tile work from a mysterious art form practiced by skilled artisans to a weekend job that even reluctant DIYers can take on. Backsplashes have long been an approachable tiling project. This is due to their limited size and the fact that they receive no foot traffic. Traditionally tiled backsplashes—ceramic tile —are simple enough to do. But peel and stick backsplashes can make an easy job even easier. With the traditional backsplash, a wet mineral-based material, thinset, causes the ceramic, porcelain, glass, or metal tile to stick to the wall. Another mineral product--grout--fills in the seams between the tiles. Using ceramic tiles can be intimidating for DIYers who do not feel confident about their tiling skills. Peel and stick backsplashes may be the solution. 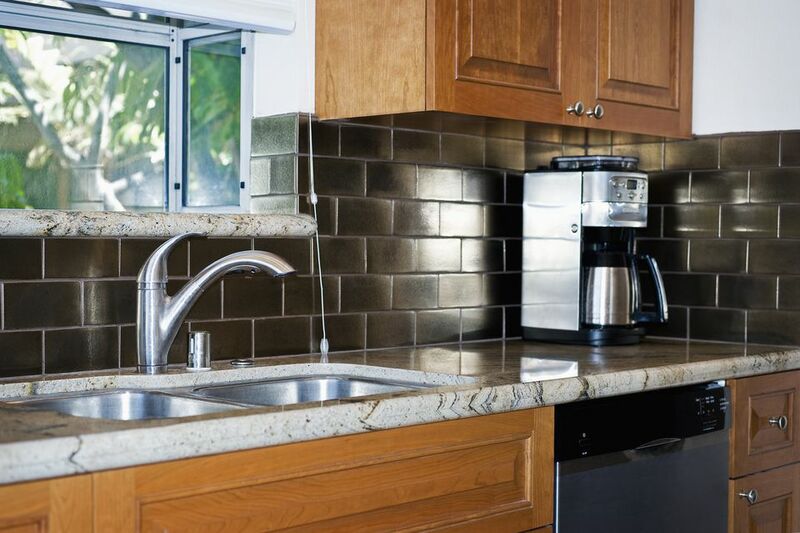 These backsplash tiles tend to be made of lighter materials such as foam-backed vinyl or metal-surfaced plastic. While there is one exception noted below, it is rare to find self-stick tiles made of real glass, ceramic, or porcelain because their extra weight can cause them to loosen. All have a paper backing that peels away to expose a sticky adhesive, somewhat like the adhesive on self-stick floor tiles. Some homeowners add supplemental adhesives to mitigate the potential of tiles falling off. In some instances, the self-stick adhesive is not adequate for the job, especially if the base surface has gaps or bumps or if it is not perfectly clean and dry. WallPops are not ceramic or porcelain. Instead, these peel and stick tiles are made of a waterproof foam vinyl that is heat and humidity resistant, too. As a demonstration of how heat-proof WallPops are, you can even build a backsplash behind a kitchen stove. Similar to removable wallpaper, WallPops need a very clean and very flat surface to stick to, since they use an adhesive similar to Post-It notes. Aspect tiles have a real metal surface. With a polymer (plastic) core, Aspect tiles are surfaced on both sides with a microns-thin surface of the metal, usually aluminum. Aspect tiles install either with double-sided tape, which you can separately purchase or with construction adhesive. Aspect tiles come in honeycomb (octagonal), subway, or square styles. Mineral Tiles is true to its name. A rarity in the peel-and-stick world, Mineral Tiles' backsplash products are made of real ceramic and glass. Thus the name: mineral. This is as close you will get to a "real" backsplash material in peel-and-stick form. Mineral Tiles' peel-and-stick product go on the wall with the self-stick adhesive but require the application of traditional grout afterward. But this is a good thing. Grouting the tile—one of the easier tiling jobs to do—gives this product added realism. Fasade panels are made of thermoplastic and measure 24.5" wide and 18.5" high. Since they are bigger than the Aspect tiles, you have fewer pieces to lay. The downside of this—and of any large format tile—is that cutouts for outlets and switches can be tricky, since you may need to cut out of the center of a panel. From a distance, Fasade panels do look like the metals they try to imitate: bronze, tin, stainless steel. If you purchase a highly textured panel, you need to apply a strip of J-trim along the edges to cover up the gap between the panel and the wall. The main feature of this product is that it replicates the look of the ever-popular glass mosaic backsplash tiles. They come in 10" by 10" squares that can be easily cut between the tiles. Tiles are made of vinyl but are fully heat-resistant. With this and any of the vinyl tiles listed here, you will need to wait a couple of hours after installing the tile before you turn on high heat near the tile. This avoids loosening the tiles. Peel and stick backsplashes are sheets of lightweight, thin material, usually plastic, that stick directly to the wall using a self-adhesive. No grout, mortar, seam sealer or other materials normally associated with ceramic tile are required. In some cases, it may be necessary to add extra adhesive to the backsplash sheets to help them stick. There are some exceptions to the plastic-only backsplash sheets: Aspect Tiles have a thin metal surface atop a plastic sheet, and Mineral Tiles are made of glass.